Christmas Creations Pixel controller is used in conjunction with our R2R Player and is used with all our Singing Faces and Christmas trees products. 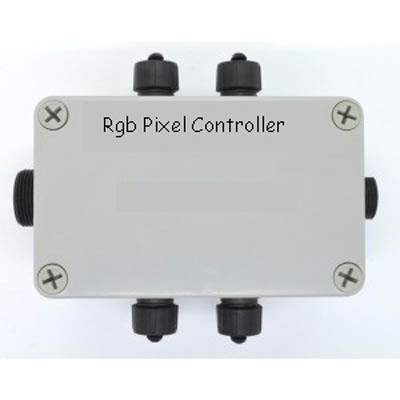 This controller integrates seamlessly with our external 12V PSU and our pixel light frames. Enclosure is screw-mountable and compact allowing easy installation in tight spaces - ideal for commercial and professional installations. It features an IP67 rated high-impact ABS enclosure with 4 waterproof male panel connectors (for direct connection to our pixel light frames), heavy duty 2 pin screw-up DC power connector (for direct connection to our 12V PSU) and a screw-up waterproof RJ45 socket for ethernet connection.